In Return of the Jedi, Vader throws his lightsaber at Luke causing the catwalk come crashing down. Luke uses this in his advantage and hides from him under the throne room platform. Unable to locate his son, Vader tried to lure Luke out of hiding. Luke was in the darkness under the staircase. Note that he was in an alcove, hence why Vader couldn't see him directly. 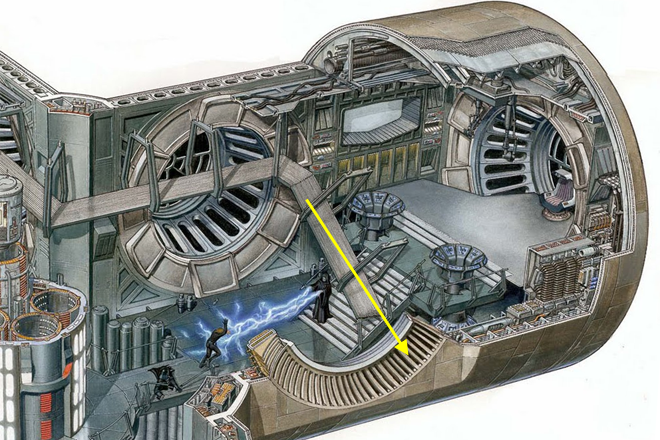 Luke ducked the lightsaber, but its blade cut through the supports that held the catwalk. Luke felt the catwalk drop, and sparks showered around him as the metal supports tore from the ceiling and he tumbled to the floor below. Uninjured, he rolled under the Emperor’s elevated platform and ducked into a dark alcove. Vader threw his scintillating blade—it sliced through the supports holding up the gantry on which Luke was perched, then swept around and flew back into Vader’s hand. Luke tumbled to the ground, then rolled down another level, under the tilting platform. In the shadow of the darkened overhang, he was out of sight. Vader paced the area like a cat, seeking the boy; but he wouldn’t enter the shadows of the overhang. 1) How could he hide from Vader? "Sensorial Perception" - See, touch, hear, smell etc. Valorum's answer cover this. "Extra-Sensorial Perception" - Feel through the force. This is not, covered by the other answer, and here I'll try to make my point. Vader stalks the low-ceilinged area on the level below the throne, searching for Luke in the semi-darkness, his lightsaber held ready. VADER You cannot hide forever, Luke. LUKE I will not fight you. VADER Sister! So...you have a twin sister. Your feelings have now betrayed her, too. Obi-Wan was wise to hide her from me. Now his failure is complete. If you will not turn to the dark side, then perhaps she will." Given the answer to 1 and 2, we can safely assume that he could hide his body, and his feelings for a time, until his fear for his sister revealed him. As powerful as Vader is with the force, he does have his limitations. He can't use force lightning as he has no real hands, and what he can "feel" through the force and otherwise are hindered by his armor and suit, "more machine than man." He can feel the darkside, fear, anger, hate, so he probes at Luke to stir those emotions. I never got the impression that Vader was looking for Luke. Not in earnest, at least. In the film, there was no visual indication of Vader actively searching for Luke's whereabouts. He paced and talked, and it seems to me as though he was positioning and posturing, both in enhancing his readiness and diminishing Luke's through intimidation and his apparent relative confidence. Like a cat with a mouse. This fits with the actions of previous Sith and Jedi in the movies when they have the upper hand, such as Darth Maul pacing intimidatingly. It seems particularly Sith, to me, that Vader would taunt Luke as he does, while also taking the time to probe his mind for additional information and weaknesses. Time was on Vader's side: Luke cannot hide forever. From a purely tactical standpoint, waiting for Luke to "charge out" of hiding to attack Vader is clearly preferable to finding Luke and therefore giving him the first strike. As I had pointed out in the comments - Vader paced the area, which isn't what you do when you're actively looking for, say, your keys. He wasn't opening doors and looking under or around objects; he was just confidently taunting and actively waiting. To further the conjecture, it appears that Vader may even have known exactly where Luke was hiding, judging by where and how he chose to pace. If Vader can read Luke's mind to extract knowledge of a twin sister, he can also extract knowledge of Luke's hiding place from Luke's mind. He really wasn't searching for Luke so much as manipulating Luke's emotions to make Luke give into anger and fear, and therefore to the Dark Side. Luke drew in on himself making his presence in the Force invisible. Not the answer you're looking for? Browse other questions tagged star-wars the-force darth-vader luke-skywalker return-of-the-jedi or ask your own question. How was Luke hiding in his duel with Vader on the Death Star II? Did Luke retrieve his Lightsaber from second Death Star? How did Luke know Vader needed his helmet to survive? How could Luke destroy the Death Star?